Built in 1864, this was one of the very first houses in the Eixample, but with all the other architectural fireworks happening around the Passeig de Gràcia, the owner, let Domènech i Montaner have his way with it in 1902. The result is the architect's most lavish residential project, the corner crowned with a dream-like ceramic cupola, the whole lathered with decoration inside and out by Domènech’s team of master decorators, led by sculptor Eusebi Arnau. For Barcelona’s élite, wealth wasn’t the only thing to flaunt on a façade: the family’s interests, social status, business connections and hobbies were advertised as well. As the ground floor of the Casa Lleó Morera was destined to house a photographer’s studio, Arnau covered it with delightful nymphs and reliefs relating to electricity and cameras, all demolished in 1943 by Loewe of Madrid of leather goods fame, for larger shop windows (oh, those perfidious Castilians!). The original cupola and interior furnishings were stripped as well. After decades of criticism, Loewe remodelled the windows and door in 1992, so the contrast isn’t quite as glaring. On the second floor, however, the nymphs survived the ruthless leather-goods-mongers, one holding a gramophone as a symbol of bourgeois leisure, another holding an electric bulb, and a third a camera. A pink column gleams from the round bay window on the right; the part visible from the street is made of Carrara marble, while the base is made of cheap Catalan stone. The lions and the mulberry tree adorning the balcony are a play on the family surname — Lleó i Morera. As much as they liked to show off in front, the smart families wanted to keep from the gaze of those living in the back (an inevitable fact of life in the grid of the Eixample). 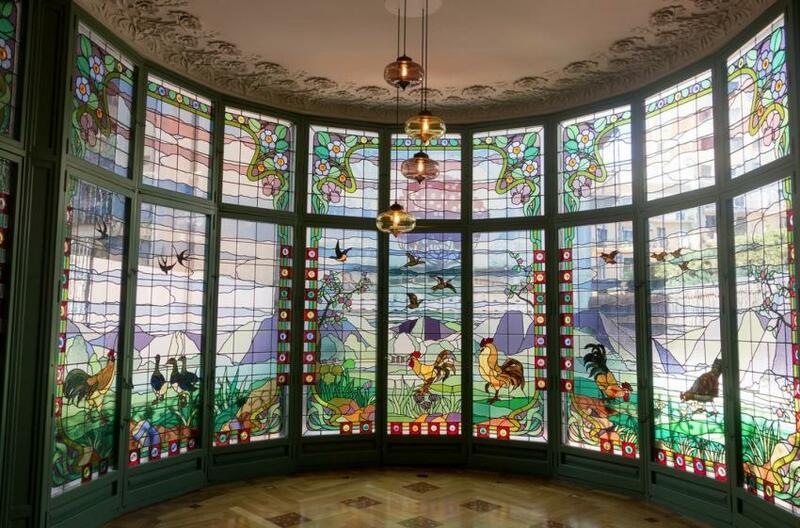 A gorgeous stained-glass bay window of rural roosters by Joan Rigalt provides both a glamorous screen and a voluptuous rush of colour, while the walls are covered in delightful ceramic mosaic portraits of the family picnicking in the countryside (small-scale versions of the type that Domènech would later use in his even more lavish Palau de la Música Catalana). The intricate floral wood inlays are by Gaspar Homar; some of the other furnishings Homar designed for the house can be marvelled at in the Museu Nacional. 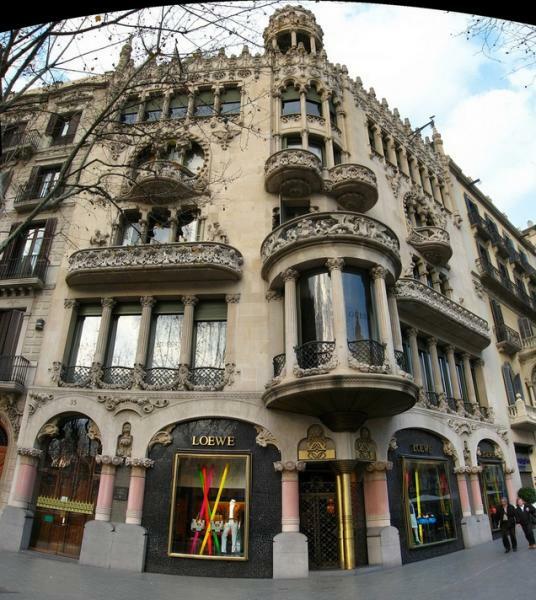 Next on the Passeig de Gràcia at No.37, is Enric Sagnier’s Louis XVI-style Casa Mulleras, the last building to be remodelled in the block (1910) and discordant in its way – an example of the post-Modernista reaction to its neighbours. Hours Tues-Sun 10am-1:30pm and 3pm-7pm. Hour long guided tours in English daily at 11am. Half hour express tours (in English, Catalan and Spanish) also available. All ticket must be purchased in advance online, although you can also buy an express ticket at the Palau de la Virreina. Adm Guided tour: €15, €13.50 under 25 and over 65; under 12 free (limit one child per adult). Express half hour tour €12.